Time is the one thing that cannot be replaced. Once it’s gone, it’s gone forever. Take advantage of the time you have while your kids are still kids. 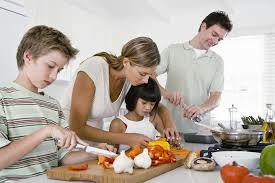 Just like scheduling work or household chores, take time to plan time for your family to have fun together. Maybe plan a monthly event – a trip to a park or the beach, game night, a cooking night where you teach your kids the basics of the kitchen and let them get creative. From personal experience, it’s the family events that become tradition that kids look the most forward to and remember for a lifetime.